Azmandian, J., Sohrevardi, S., Fazeli, F., Sarrafzadeh, F., Etminan, A., Savari, O., Ghadamzadeh, M. (2011). Diltiazem Co-Treatment in Renal Transplant Patients Receiving Cyclosporine with Respect to Concentration at Two Hours (C2). Iranian Journal of Pharmaceutical Sciences, 7(1), 3-6. Jalal Azmandian; Seyed Mojtaba Sohrevardi; Faramarz Fazeli; Farhad Sarrafzadeh; Abbas Etminan; Omid Savari; Mojtaba Ghadamzadeh. "Diltiazem Co-Treatment in Renal Transplant Patients Receiving Cyclosporine with Respect to Concentration at Two Hours (C2)". 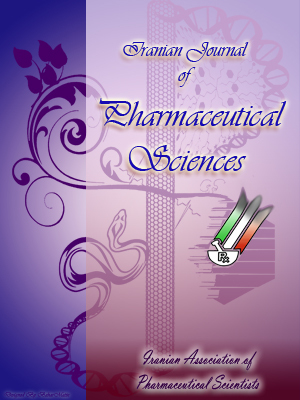 Iranian Journal of Pharmaceutical Sciences, 7, 1, 2011, 3-6. Azmandian, J., Sohrevardi, S., Fazeli, F., Sarrafzadeh, F., Etminan, A., Savari, O., Ghadamzadeh, M. (2011). 'Diltiazem Co-Treatment in Renal Transplant Patients Receiving Cyclosporine with Respect to Concentration at Two Hours (C2)', Iranian Journal of Pharmaceutical Sciences, 7(1), pp. 3-6. Azmandian, J., Sohrevardi, S., Fazeli, F., Sarrafzadeh, F., Etminan, A., Savari, O., Ghadamzadeh, M. Diltiazem Co-Treatment in Renal Transplant Patients Receiving Cyclosporine with Respect to Concentration at Two Hours (C2). Iranian Journal of Pharmaceutical Sciences, 2011; 7(1): 3-6. Cyclosporine (CsA) is a drug that has been used for prevention of kidney transplant rejection for many years. Diltiazem with the inhibition of cyclosporine metabolism and clearance will increase CsA concentration and CsA dose can be decreased. The aim of this study was the evaluation of diltiazem effect on CsA dose adjustment with respect to C2. Forty stable renal transplant patients who were receiving CsA, prednisolone, mycophenolate mofetile as well as diltiazem were enrolled in the study. At first, minimum concentration of CsA (C0) and concentration within 2 h after dosing (C2) were determined in every patient. These patients were randomly assigned to an 8-week period of continued therapy with diltiazem (20 patients), or to a washout period removing diltiazem from the treatment (20 patients). At the end of this period, CsA concentrations were measured. Thereafter, the groups underwent a crossover followed by either diltiazem washout or reinstituted treatment with diltiazem. Then C0 and C2 were measured. In each step which diltiazem was removed from patient drug regimen, CsA dose was increased by 25%. Finally, we detected that this amount of CsA dose adjustment is suitable in our patients and C0 and C2 remained in the therapeutic windows. Diltiazem co-administration with CsA will be safe and cause decreased patients drug cost. Kidney transplantation is the most common treatment for end stage renal disease, regardless of the primary cause. Kidney trans-plantation is a life-extending procedure which typically helps the patients to live a better life. The major barrier in kidney transplanta-tion is the recipient's immune system since transplanted organ would be identified as a non-self organ and would be rejected by the immune system. Thus, to suppress the immune system having immunosuppressive drug is essential. Cyclosporine (CsA) is an immunosup-pressant drug which is widely used in organ transplantation to reduce the activity of the patient's immune system so the risk of organ rejection will decrease [1, 2]. By using CsA as an immunosuppressant drug, chance of a successful transplant from deceased donors will increase from 50% to 90%. Cyclosporine is a cyclic nonribosomal peptide of 11 amino acids produced by the fungus Beauveria nivea, and contains a single D-amino acid. CsA is thought to bind itself to the cytosolic protein cyclophilin of immunocompetent lymphocytes, especially T-lymphocytes. This combination of cyclosporin and cyclophilin inhibits calcineurin, which under normal circumstances, is responsible for activating the transcription of interleukin 2. It also inhibits lymphokine production and interleukin releasing and, therefore, leads to a reduction of the function of effective T-cells. CsA is metabolized by CYP450 enzyme, therefore, it has a high potential for interaction with some other drugs. One of these drugs is diltiazem [1, 2]. Diltiazem can also reduce clearance of cyclosporine . The interaction between CsA and diltiazem can be used to reduce CsA’s dosage and toxicity. Such an interaction is useful for patients and health system [4, 5]. Minimum concentration of CsA (C0) has been used as monitoring CsA therapy for many years but recently, the significance of maximum concentration has been elucidated . Patient management with Neoral C2 monitoring reduces the incidence and severity of acute rejection in comparison with C0 monitoring . C0: 150-450 μg/ml and C2:0.2-8 μg/ml is the proper blood level in constant phase for CsA . The only study which reported the correlation between concentration within 2 h after dosing (C2) and diltiazem is done by Aros et al. who found that the CsA daily dose was lowered 19% by diltiazem [8, 9]. This study is different from Aros study in some ways. Here, we don’t use azathioprin as a usual medicine to prevent rejection and there are differences in pharmacogentics in the two populations. Aros conducted his study only on 10 patients, thus we decided to evaluate this drugs interaction in Iran in a larger population based on our usual antiregection drug regimen and genetics. In this study, the effects of CsA monotherapy is compared to the combination of CsA and diltiazem. Sixty stable renal-transplanted patients, who had a kidney allograft at least for 3 months and took diltiazem and CsA (Neoral) simultaneously, were chosen randomly from those who had referred to our department between 2005 and 2006. They were divided in two different groups, each of containing 30 patients. Twenty patients were excluded due to allograft rejection, death (one of them due to infection and the other in a car accident) and some were not interested, therefore, 40 stable renal-transplanted patients who were receiving CsA, prednisolone, mycophenolate mofetile as well as diltiazem were enrolled the study. In this double-blind clinical trial, cyclosporine blood concentration was measured twice a day at C0 (minimum CsA concentration) and C2 (concentration at 2 hours after dosing) via cyclosporine measuring kit and by radioim-munoassay method. At the first, C0 and C2 were determined in all patients. These patients were randomly assigned to an 8-week period of continuous therapy with diltiazem (20 patients), or to a washout period removing diltiazem from the treatment (20 patients). At the end of this period, CsA concentrations were measured. Afterwards, the groups underwent a crossover followed by either diltiazem washout or reinstituted treatment with diltiazem. Then C0 and C2 were measured. In each step that diltiazem was removed from patient drug regimen, CsA dose was increased by 25%. No change was done in the first group’s drug regimen. In the second group, diltiazem was omitted and CsA dose was increased by 25%. At the end of the second month, a crossover was made in group’s drug regimen, and at the end of forth month drug regimen was returned to its initial condition (before the study was began). Besides measuring CsA blood concentration, we also measured blood pressure, heart rate, BUN, SrCr, and LFT. CsA blood concentration was measured by radioimmunoassay method in Kerman Afzalipour Hospital and all statistical analyses were performed using SPSS software (version 13.0). The ethic committee of the Kerman University of Medical Sciences has approved this study. Table 1. Averages of variables in different stages of assessment. The mean age of two group were 42 and 44.3, respectively (p =0.48). First group contained 10 men and 10 women who were at the 7.3 month after transplantation, and the second group contained 8 women and 12 men who were at the 6.8 month of transplan-tation (p=0.52). Hypertension and diabetes, diabetes and hypertension were the cause of renal failure in the two groups, respectively. Mean body weight in the first group was 63 kg and in the second group was 61.5 kg (p=0.61). Other characteristics of the subjects were shown in Table 1. There was no statistically significant difference between C0 and C2 in the two groups at the end of study. Diastolic blood pressure was the only variable which showed a statistically significant difference between two groups (p=0.02). Regarding C0 and C2 values in both groups, there was no significant difference between maximum cyclosporine concentration (p=0.11). In each group, diltiazem was omitted and CsA dose was increased by 25%, regarding our data in Table 1, the mean of cyclosporine blood concentration based on C2 remained in its therapeutic windows. In Aros et al. study, the cyclosporine daily dose was lower with diltiazem (p=0.002), but despite a dose reduction of only 19.0±1.5%, there was a trend to a larger AUC/dose (p=0.1) and a trend to an increased C2 when treatment included diltiazem. In this study, ethic committee suggested that when diltiazem dosage is increased or its administration was stopped, cyclosporine dosage should have been increased and decreased respectively to maintain patients' cyclosporine blood concentration in the safe margin. Based on our physicians' experiences, change of cyclosporine dosage was considered to be 25%. By looking at these findings, it is clear that diltiazem in transplanted patients inhibit cyclosporine metabolism with the same amount. It can be concluded that our first hypothesis was properly framed. Therefore, cyclosporine dosage ought to be regulated around 25% if diltiazem is stopped or given; while in Aros study, diltiazem caused 19% change in the level of cyclosporine blood concentration. In another study which was done on heart transplant patients, it was reported that diltiazem increased 20-75% cyclosporine blood concentration . Bunnag et al. found that the dosage of CsA could be reduced by 25.8% to maintain the same levels of C0 and C2 in the same patients after taking diltiazem . Ingsathit et al. showed that the effect of diltiazem on cyclosporine dose is variable during time . This study illustrated the effect of diltiazem in reduction of cyclosporine dosage and decrement of treatment expenses; therefore, it is recommended that diltiazem and cyclosporine be administered simultaneously. Quan DJ, Winter ME. Immunosuppressants: cyclosporine tacrolimus and sirolimus. In: winter ME. Basic clinical pharmacokinetics. 4th ed. Phliadelphia: Lippincott Williams and wilkins; 2004. P. 228-50. Danovitch GM. Immunosuppressive medications and protocols for kidney transplantation. In: Danovtch Gm. Handbook of kidney transplanta-tion, 4th ed. Philadelphia: Lippincott Williams and Wilkins; 2005. P. 72-134. Sketris IS, Methot ME, Nicol D, Belitsky P, Knox MG. Effect of calcium-channel blockers on cyclosporine clearance and use in renal transplant patients. Ann Pharmacother 1994; 28: 1227-31. Kumana CR, Tong MKL, Li CS, Lauder IJ, Lee JSK, Kou M, Walley T, Haycox A, Chan TM. Diltiazem co-treatment in renal transplant patients receiving microemulsion cyclosporine. Br J Clin pharmacol 2003; 56: 670-8. Xue W, Ding X, Tian P, Pan X, Yan H, Hou J, Feng X, Xiang H, Tian X. Long-term follow-up of co-administration of diltiazem and cyclosporine in Chinese kidney transplant recipients. Ren Fail 2010; 32: 314-9. Kavukçu S, Soylu A, Türkmen M, Kasap B, Gümüştekin M, Gülay H. Two-hour post-dose cyclosporin A levels in adolescent renal transplant recipients in the late post-transplant period. Pediatr Nephrol 2004;19: 667-71. Levy G, Thervet F, Lake J, Uchida K. Patient management by Neoral C2 monitoring: an international consensus statement. Transplanta-tion 2002; 73 (Supp): S12-8. Aros CA, Schneider Ho, Flores CA, Ardiles LG, Alruiz PA, Jerez V, Mezzano SA. Correlation between C2 and AUC 0-4 in renal transplant patients treated diltiazem. Transplant Proc 2005; 37: 1580-2. Aros CA, Ardiles LG, Schneider HO, Flores CA, Alruiz PA, Jerez VR, Mezzano SA. No gender associated differences of cyclosporine pharmaco-kinetics in stable renal transplant patients treated with diltiazem. Transplant Proc 2005; 37: 3364-6. Page RL, Miller GG, Lindenfeld J. Drug therapy in the heart transplant recipient: part 4: drug-drug interactions. Circulation 2005; 111: 230-9. Bunnag S, Vareesangthip K, Ong-ajyooth L. Effect of diltiazem on the pharmacokinetics of microemulsion cyclosporine A in renal transplan-tation. J Med Assoc Thai 2006; 89 (Suppl 2): S228-34. Ingsathit A, Sumethkul V, Chalermsanyakorn P, Jirasiritham S. Co-administration of diltiazem and cyclosporine for kidney transplant recipients: a four year follow-up study. J Med Assoc Thai 2006; 89 (Suppl 2): S235-41.